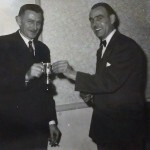 Posted 9 February 2016 & filed under 1950s, 1960s, Life and leisure, Pubs and clubs. The St Julian’s and Cottonmill Men’s Club, usually referred to as the Cottonmill Men’s Club, was founded in 1953. Meetings were held on Fridays at Mandeville School. 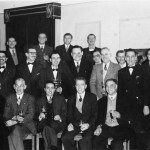 According to one of their chairmen, Mr W. Christie, the club was founded on comradeship and sportsmanship. 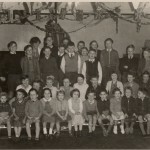 They held Christmas parties for the children on the new estates and day trips to the seaside. 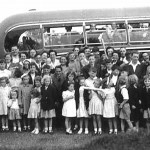 Alan Beardmore remembers a great day out in Clacton one year. 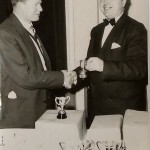 The club held annual dinners – photos below of one of them which was held at the Water Splash London Colney in 1955 – and a competition for a cup which was awarded annually, called the “Macgood” Challenge cup which was organised by Mr J. Walker. 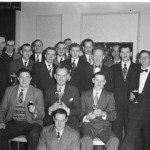 Some of the founder members of the club included: Mr W. Christie, Mr Cotton, Mr Kerr, Mr Stan Buckingham (also Mandeville school caretaker), Mr Bill Wells, Mr Williams (caretaker St Julian’s School), Mr Beardmore, Mr Bill Walker (who ran the greengrocers in Abbots Avenue West), Mr Peter Beard, Mr Harry Collins, Mr E. Cotton, Mr A. Hill, Mr Ferguson, Mr Ward, Mr Arthur Stonham. 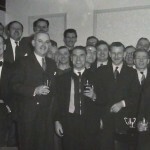 Alan Beardmore’s father, F.W. 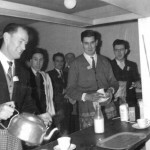 Beardmore, was an excellent photographer and took many photos of the club activities. Some of these, courtesy of Alan Beardmore, are shown below. 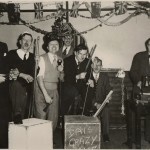 Christmas party 1953. 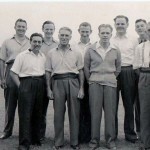 Alan Beardmore is in the centre next to his brother Neil. John Stonham is to Alan’s left leaning forward and David Clarke is on his right. At end of same row on right is David Williams. Back row L-R: unknown, unknown, Peter Beard, Bill Wells, Bill Walker, F.W. Beardmore. 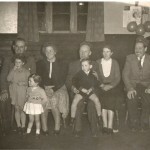 Front row L-R: unknown, unknown, Mr Buckingham Jnr, Mr Stan Buckingham.